Woo hoo!! I finally finished something! 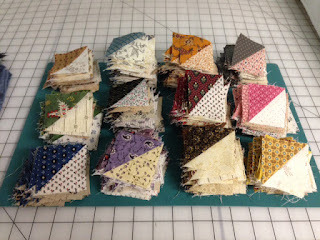 I've been working on a fabulous, tedious, awesome quilt for the Westside Quilters Guild show in October. When you're one of the featured quilters, along with Elizabeth Hartman, you kind of feel the need to "up your game." I'm hoping to have that top finished by the end of June, but I did manage to get something else finished -- a pattern! I made this darling quilt and taught it as a class last year at Ocean Waves Quilt Camp (which will be held October 28-November 1 this year). However, I never finished the pattern. After presenting it as part of a program at the Mid-Valley Quilt Guild in Salem, it was time to put it on the top of my list. It's really nice to have something finished! Have a fabulous Friday! 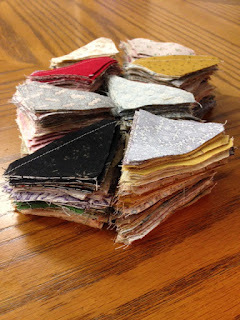 I've been participating in a Round Robin quilt with five of my friends. We brought our quilt centers to a meeting in September and have been swapping quilts every 6-8 weeks. This was a very wide open, no rules, kind of swap. We each made our own center, included fabrics in a bag, and sent our merry block on its way to grow up into a wall hanging or quilt. We never saw our quilt again until the reveal! I've had a lot of fun with this Round Robin, but don't think I'll be participating in another for a while. This was a bit more challenging than I may be willing to admit. :) However, the quilts are all beautiful! 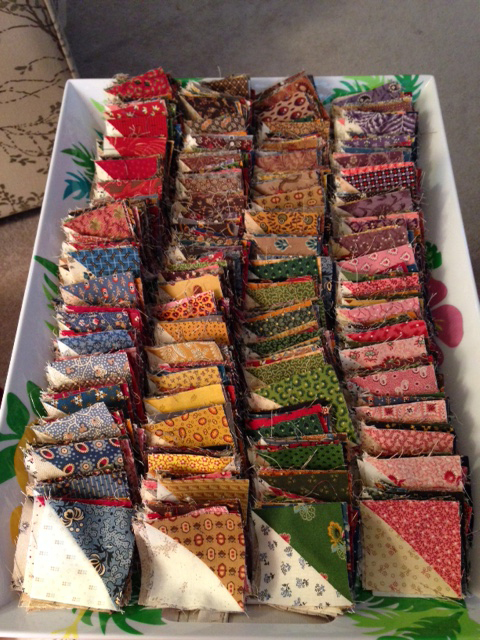 I'll try to get pictures of everyone else's quilts, but for now you'll have to settle for several pictures of mine. The quilt is 82" square (!) so it doesn't even fit on my design wall. I made the center block with stars and poppies based on a Bonnie Sullivan design. Cheryl added the next border, which she stitched BY HAND while on a trip to Alabama. 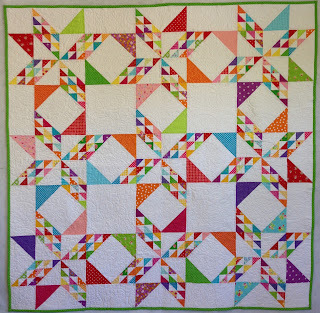 Annette added the next border -- a unit we affectionately call wings. 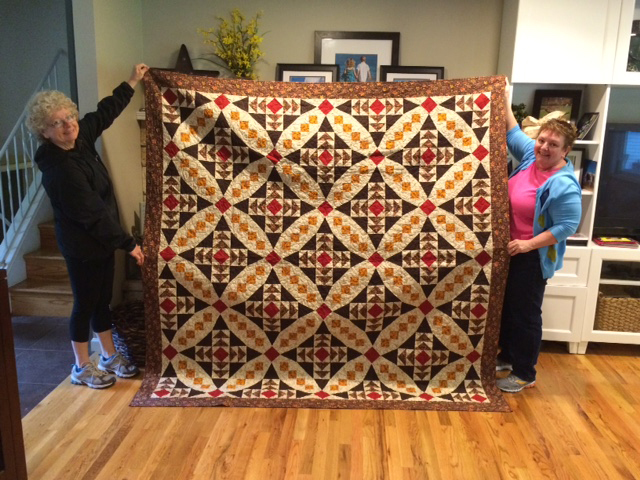 Lynn was known for going over the top on all of our quilts. She added the Churn Dash Stars border. 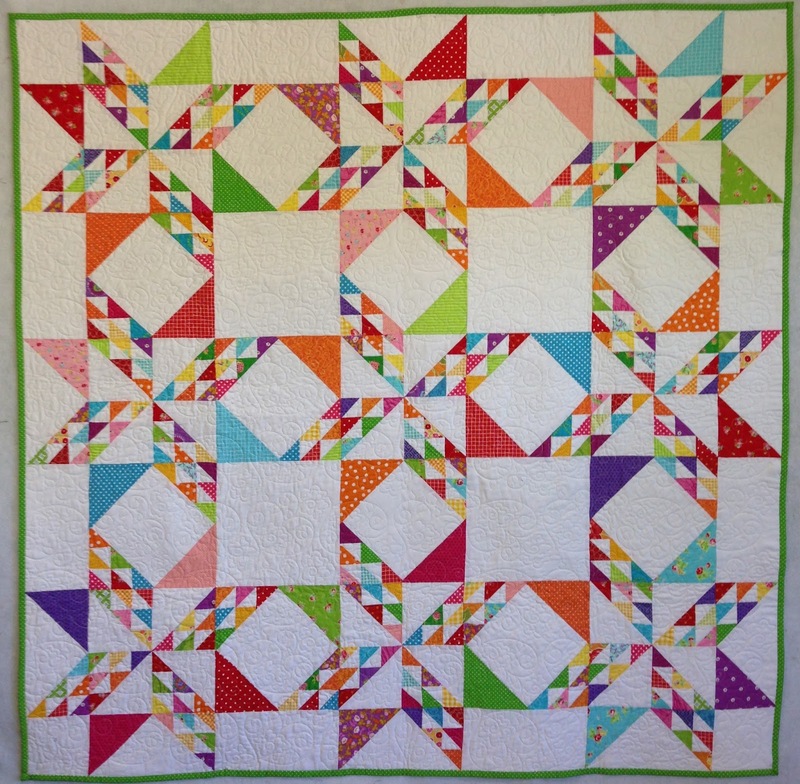 Donna knew exactly what she wanted to do as soon as she saw my quilt and this fun border was added next. 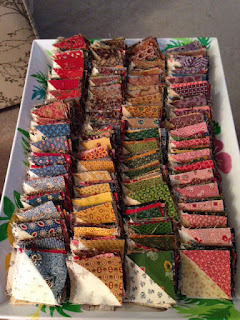 I love, love, love my quilt and have a backing already picked out for it. 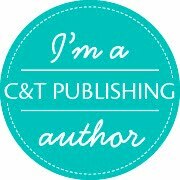 Not sure what I'll bind it in, but that can wait for another day. The funny story behind this is that I made this quilt, then didn't love it. My friend Donna made the small version and once she had hers quilted, I LOVED it! Too late, though, as I had already given mine away. I borrowed it back for this reveal and am a tad bit sorry I didn't keep it all along. Guess it's time to make another. I'm thinking two greens, red, pink, and a white background. It might look a little like a Christmas cactus and I'm okay with that.